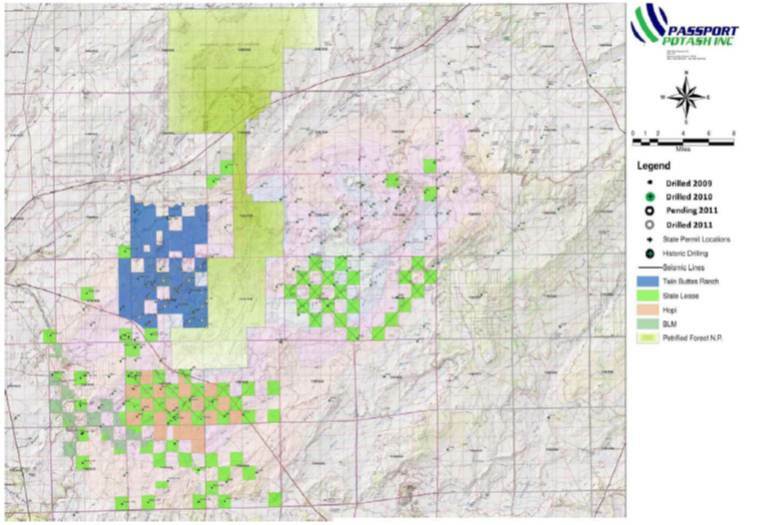 Is there oil and gas potential in Arizona's Mancos Shale? Growing recognition of shale oil and gas potential in northwest New Mexico might draw similar interest in Arizona's Mancos Shale. The Mancos Shale in New Mexico's San Juan basin is exciting the petroleum industry as the country's next hot shale play. More than 500 attendees showed up at the San Juan Basin Energy Conference in Farmington recently to hear that the basin could produce 6 billion barrels of oil (10% of the 60 billion in place), using hydraulic fracturing ("fracking") and horizontal drilling technology. Reports are that the 22 wells drilled there so far have demonstrated commercial potential. northeastern Arizona. 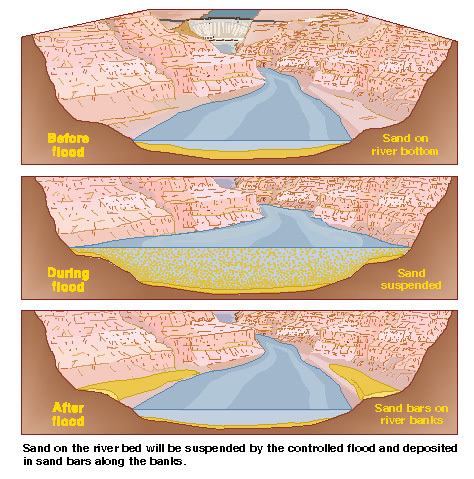 A USGS professional paper on the coals of the Colorado Plateau includes a chapter on the Cretaceous-aged Mancos Shale. The chapter lead author is Dale Nations, formerly geology professor at NAU, and currently chair of the Arizona Oil & Gas Conservation Commission. Dale and co-authors map the extent, depth, and thickness (above) of the Mancos along with stratigraphic cross sections (left). 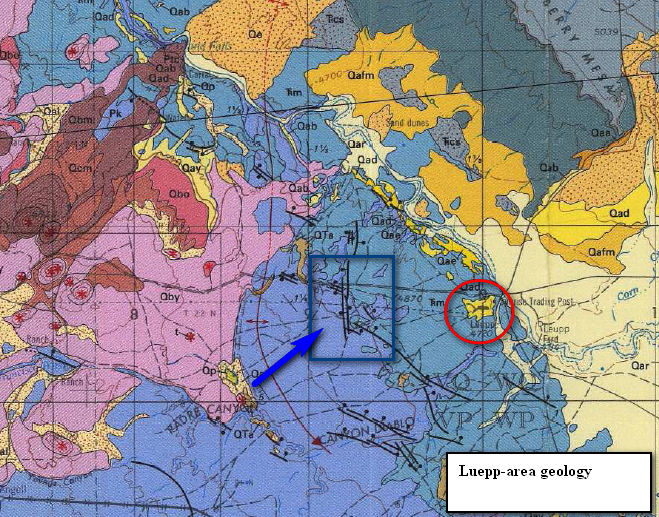 We are not aware of any geochemical data that would indicate the petroleum potential of the unit in Arizona. But given the enthusiasm demonstrated for the Mancos just over the border in New Mexico, one has to expect that Arizona will soon be attracting exploration interest as well. At a special meeting of the State Transportation Board today, the board approved $1 million to design improvements to Navajo Route 20, a Navajo Nation tribal road that runs parallel to the damaged highway. Approximately 27 miles of the roadway are unpaved. “ADOT has been working with the Navajo Division of Transportation, the Navajo Nation and the Bureau of Indian Affairs to pave N20 as an interim measure to shorten the detour route between Flagstaff and Page,” said Dallas Hammit, ADOT deputy state engineer of development. “With assistance from the Federal Highway Administration, we are looking to use federal emergency relief funds to restore essential traffic in the region, while we work on the ultimate repair on US 89. “This is not the long-term solution, but it will help the thousands of people who are inconvenienced daily by this unscheduled detour caused by last month’s landslide,” Hammit said. As part of ADOT’s plans to improve the existing 44-mile-long tribal route, which is mostly a dirt road stretching from Bodaway-Gap to LeChee, ADOT would designate the road as Temporary US Route 89 (US 89T). ADOT would pave the road and ensure that it could carry commercial truck traffic, while repairs are made to US 89. The agency is already working with potential contractors and construction could begin as soon as late spring. The US 89T project is expected to take three to four months to complete. The ability to pave Navajo Route 20 is contingent upon agreements being reached with several stakeholders, including the Navajo Division of Transportation, the Navajo Nation, the Bureau of Indian Affairs and the Federal Highway Administration. After the reconstruction of US 89 is complete, the road will be relinquished to the Navajo Nation. There is no timetable for reopening the highway, but ADOT is committed to restoring this important travel route as soon as safely possible. While US 89 remains closed indefinitely, the current primary detour route is to take US 160 through Tuba City to SR 98 toward Page, which is approximately 45 miles longer than the direct route. Drivers also have the option to take US 89A north to Marble Canyon toward Fredonia to reconnect to US 89 in Kanab, Utah. US 89 has been closed north of Bitter Springs and south of Page since Feb. 20 due to a landslide that buckled pavement on the mountain slope. ADOT is currently conducting a geotechnical investigation, which is the first phase of the solution. Crews are monitoring the stability of the slope and the ultimate repair of US 89 will be based on the results of the geotechnical investigation. For more information, including the latest blog posting on ADOT’s geotechnical work, please visit the ADOT Blog. ADOT launched a range of communication tools, including a new webpage (www.azdot.gov/us89), dedicated to keeping the public informed about the status of the closure and alternate travel routes, complemented by videos, photos of the roadway damage on US 89, and updates on the progress of geotechnical crews. The next edition of our online video magazine Arizona Mining Review, will look at the Florence Copper in situ copper recovery project in Florence, a new survey on how the international mining company views Arizona for doing business, and the potential for rare earth elements in Arizona. 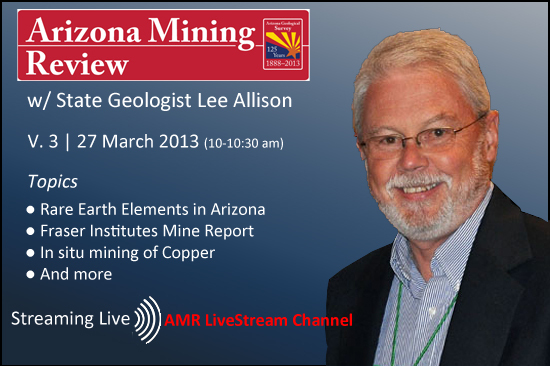 AMR will be streamed live at 10 am MST/PDT on Wednesday, March 27. Each show is recorded and posted to the AZGS YouTube channel so you can view it later. In an op-ed piece in the Arizona Republic today, former Governor Rose Mofford called for reopening the Arizona Mining & Mineral Museum but at its long ago home at the State Fair grounds in Phoenix. 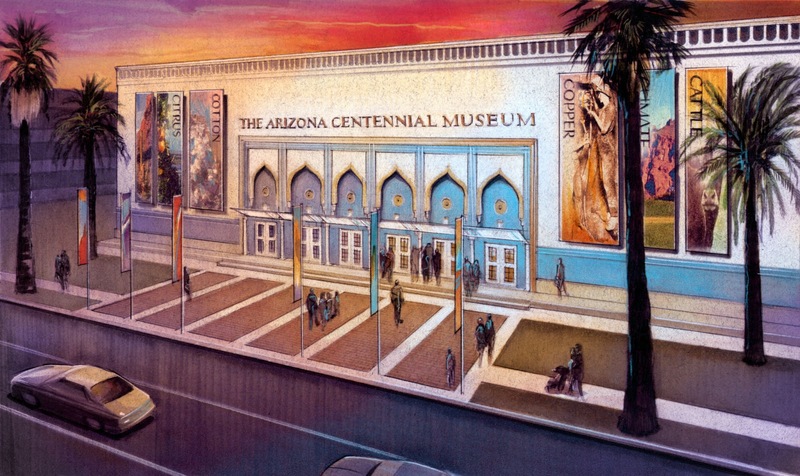 The museum had been housed on the Capitol Mall in Phoenix until 2010 when it was transferred to the Arizona Historical Society to become the home of the Arizona Experience museum [right] in celebration of the state's centennial. The minerals and other exhibits were removed for the remodeling of the building but the hoped-for private contributions to fund the new museum have not been forthcoming, putting the museum plans on hold. Fans of the mining and mineral museum have carried on a continuing campaign to reopen it or have a replacement built. Legislation was introduced both last year and in the current session to have AZGS create a museum. Neither version has had a hearing. Among the many recommendations is that "national industry organizations and educational institutions should also embark on an informational campaign to educate students, parents, educators, and public policy makers about the importance of the energy mining industries to our economic and national security, the relevance of STEM education to jobs and careers in these industries, and job availability." This would be aimed at overcoming "A negative public perception of U.S. extractive industries...[which] dissuades some from pursuing careers." The Canadian geothermal energy industry just can't get no respect. The Canadian Geothermal Energy Association (CanGEA) annual meeting got underway last night in Calgary, Alberta, with a sense of frustration but some emerging optimism that a new geothermal favorability map for Alberta will ignite interest from both industry and government and be a model for similar assessments nationwide. Steve Richard and I were invited to the meeting to participate in a Mapping & Database workshop today to share the results of our work developing the National Geothermal Data System in the US and how it applies or might be deployed to Canada. We toured the geothermal exchange energy system at the Hotel LeGermain in downtown Calgary last night, across the street from the iconic Calgary Tower. This three year old complex of hotel, adjacent office building, and condos, is powered by a series of 600-foot deep geothermal wells under the foundation. This direct use of geothermal energy, rather than electricity production, may offer one of the best hopes for energizing this nascent resource in the region. The giant 'crack' reported on the Navajo Reservation in northeast Arizona, appears to be part of an extensional fault system (graben) previously mapped in 1984 by George Billingsley of the USGS, according to AZGS geologist Joe Cook. Joe linked the mapped fault with aerial imagery (below). The Navajo Post newspaper is asking about the cause of a giant crack in bedrock along Leupp Road on the Reservation. They say it's been around a long time but recent activity has prompted fences to be erected around it for safety. The Google Earth view at right (NW at top) shows the trend of the 900 foot long fracture is a parallel to joints in the Kaibab Limestone and on trend with fractures across the region from Holbrook to the southeast and for miles to the north and northwest. George Billingsley with the USGS has mapped a number of small grabens in the area (see map below). Brian Gootee at AZGS reports that there are many of these ‘expansion joints’ in the Kaibab/Moenkopi rocks in the area. 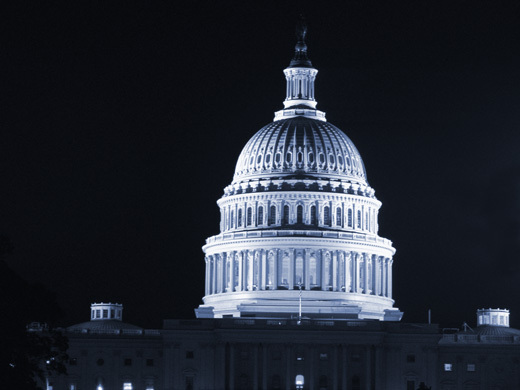 The U.S. House Subcommittee hearing on the proposed Resolution Copper land exchange (HR 687) will be broadcast live on Thursday, March 21 at http://naturalresources.house.gov/live/. The Committee will also consider another half dozen mineral resource bills. The Pinal County Board of Supervisors voted unanimously last week to urge Congress to pass the land exchange bill that is key to the Resolution Copper mine being developed. H.R. 687, or the "Southeast Arizona Land Exchange and Conservation Act of 2013" will have a hearing in the House Subcommittee on Energy and Minerals on March 21. Meanwhile, opponents to the mine spoke against a similar position being considered by the Globe town council. The Council deferred voting until representatives of Resolution Copper could be given a chance to make their case. The Resolution copper mine would be underground (vs an open pit like many other Arizona copper mines) at a depth of over 7,000 feet, producing an expected 25% of the nation's copper needs for 40 years. It would be one of the largest copper mines in the world. But project partners Rio Tinto and BHP Billiton, the two largest mining companies in the world, insist they cannot go forward until they get access to lands around the Oak Flats area that are excluded from mining by federal law [right, credit Resolution Copper]. Resolution proposes to trade blocks of critical environmental lands they have bought around the state in exchange for a smaller block of acreage over the proposed mine. That trade is opposed by the San Carlos Apaches who consider some of the lands sacred. H.R. 767 (Cramer), To amend the Energy Policy Act of 2005 to modify the Pilot Project offices of the Federal Permit Streamlining Pilot Project. The University of Arizona is #1 in the nation for its Geology specialty graduate program and #7 for Earth Sciences graduate program overall, according to the America's Best Graduate School rankings from US News & World Report. ASU came in at #17 in Earth Sciences. ASU said this makes it "the highest ranking science program at ASU, and among the top 10 universities in the western United States." More than 100 earth sciences graduate programs were surveyed. This year, two out of four specialty earth science programs at ASU are ranked in the top 20 in the nation. These include Geochemistry (ranked 16th) and Geology (ranked 17th). UA ranked #10 in Geochemistry, and #14 in Geophysics-Seismology. Ann and I went up to nearby Gates Pass in the Tucson Mountains to catch a glimpse of Comet Pan STARRS tonight and we were not disappointed. The popular turn out at the Pass was overflowing with other Tucsonans, most with binoculars, spotting scopes, or the real thing. We had our spotting scope with us. From our vantage the comet showed up almost directly below the crescent moon. The tail was nicely defined and seemed to change color as dusk deepened, at one point looking somewhat green to me. 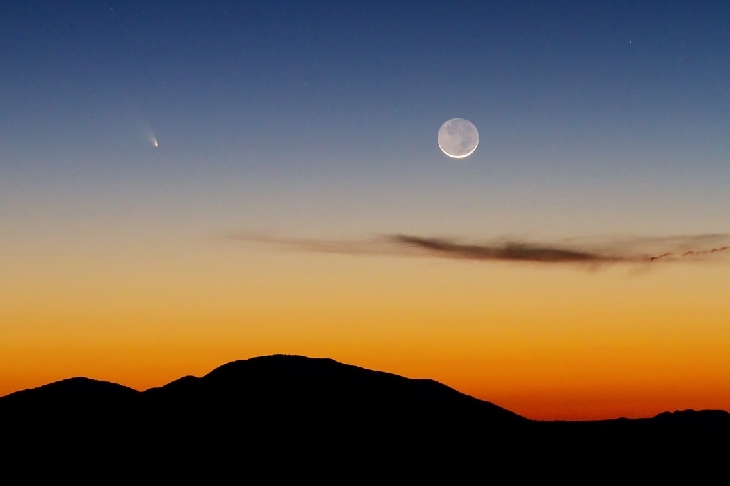 We watched until the comet dropped low enough in the sky it appeared to be fading, possibly from trying to view it through the thicker atmosphere. Only a couple people tried taking photos of the comet with handheld cameras using the flash. For some reason, a line from an old Buffy St-Marie folk song ran through my mind, "God is alive, magic is afoot." *Mineral resources that are not mineral reserves do not have demonstrated economic viability.